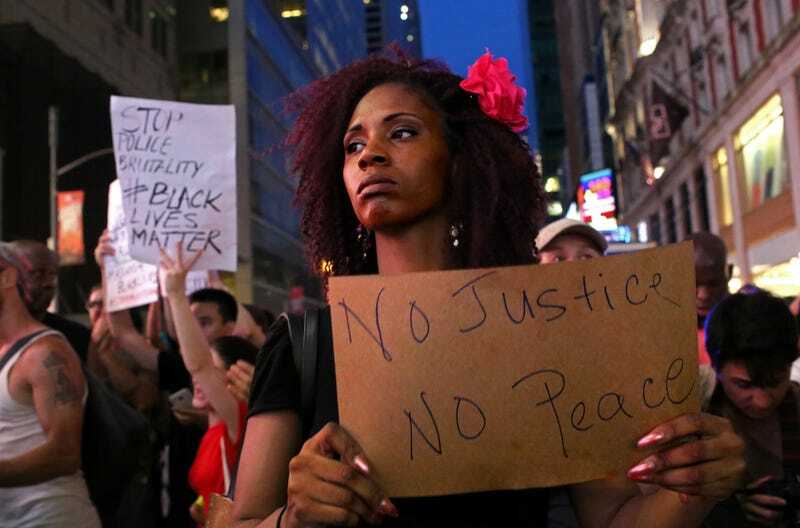 Activists protest in New York City’s Times Square on July 7, 2016, in response to the recent fatal shootings of two black men by police. Protests and public outcry have grown in the days following the deaths of Alton Sterling on July 5, 2016, in Baton Rouge, La., and Philando Castile on July 6, 2016, in Falcon Heights, Minn. Throughout the summer, new hashtags representing the names of black and brown people who have lost their lives to police violence have flooded our social media feeds. #KorrynGaines, #PhilandoCastile, #AltonSterling and hundreds more people’s lives have been tragically cut short at the hands of police. This week, on Tuesday, communities came together under a different hashtag, #SafetyIs, to discuss how they can feel safe without focusing on cops. Every year on Aug. 2, the National Association of Town Watch hosts National Night Out—an event promoting how building relationships between police and community can make communities safer. But for black and brown communities, better relationships with police are not the pathway to safety. Thus far in 2016, police have killed more than 600 people, and nearly half are people of color. For communities of color, getting to know individual police officers will not address the systemic violence of policing, which targets them on a daily basis. For too long, our communities have faced disinvestment, criminalization and incarceration, and part of the solution lies in thinking about safety in terms of what we need to survive and thrive. The Ella Baker Center for Human Rights, in collaboration with more than 30 organizations across the country, celebrated an alternative event Aug. 2 called Night Out for Safety and Liberation. The national event moves the conversation about public safety beyond policing and crime and toward how we can build safer neighborhoods by reinvesting in community-based resources. During the #SafetyIs TweetChat Tuesday, people shared the need for opportunities in education, more mental-health-care facilities, living-wage jobs and access to healthy food. People reflected on six questions throughout the hour, including, “If you could ask the next president to do one thing to create safe communities, what would it be?”—allowing them to reflect on their own individual impact and think of ways to better their communities. As the Twitter chat came to a close, events started to come to life. This year, organizations hosted Night Out for Safety and Liberation events in more than 25 cities across the United States. The events ranged from block parties to rallies to vigils. People came together to share what makes them feel safe in their communities: living-wage jobs, access to health care and housing, quality education, healthy food and more. Through Night Out for Safety and Liberation events, even more issues were brought to the surface to address disparities in communities of color. A young woman in Washington, D.C., performed a piece on street harassment in order to voice frustration about a common issue faced by women in communities of color. While disparities are often left unseen, the Night Out for Safety and Liberation highlighted what safety looks like for all people, especially women today. Zohrabi reminded us why when she stated, “Every burden placed on a sister's back is carried collectively.” Although we may not all face the same issues, a community is affected by the collective burdens of each individual. As the events carried on throughout the night, people continued to share their thoughts on what #SafetyIs to them online. While all discussions focused on safety, many used community art, music and expression as a method of facilitating such discussion. During the Night Out for Safety and Liberation event in Lowell Park in West Oakland, Calif., community members created art together, planted seeds, had tarot readings done, and watched performances by musicians and dancers. The Night Out for Safety and Liberation came to a close Tuesday, but we know the conversation does not stop here. As we continue to create safer communities and think about what #SafetyIs to us, we will further our work to change the conversation about safety to be about more than crime and fear. #SafetyIs continuing to work toward systemic change holistically—not just in terms of policing, but in terms of community reinvestment. Hailing from Queens, N.Y., Natalia Renae Delery currently works as a policy and analysis intern at the Ella Baker Center for Human Rights, courtesy of a grant from the Pozen Center for Human Rights. She is a senior at the University of Chicago studying comparative human development, with hopes of entering the world of education or criminal justice after graduation.